Older adults are a growing segment of our community, so it was my pleasure today to join with other Mayors throughout Santa Clara County to deliver hot meals to some Los Gatos residents who are not able to shop and cook for themselves. 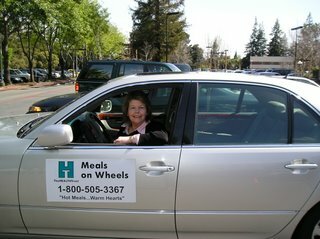 It was all part of a national program to call attention to the risk of malnutrition among seniors and to publicize the benefits of Meals On Wheels in bringing stay-at-home elderly nutritious hot meals every day. I visited with EUGENIA and ELMARS BLUMBERG and BARBARA BROWDER, all long-time residents of Los Gatos. It is so important for a community to watch out for those who may be isolated and in need of a helping hand. Meals On Wheels does a great job in serving their nutrition needs, but I wonder how many others might be living in our neighborhoods who could use friendly assistance from neighbors. Thank you LINDA GALLO, Los Gatos Senior Services Coordinator, who accompanied me today.